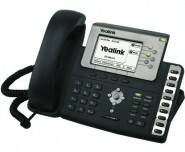 The Yealink T28P is a PoE enabled advanced IP phone featuring 6 lines and HD voice hardware and software support. The T28P features a 4" LCD graphical screen, headset/EHS support, and PoE with 2 ports of 10/100 Ethernet. The Yealink T28P represents the next generation of VoIP phones which are designed for the business user who needs rich telephony features, friendly UI and superior voice quality. The T28P is equipped with the TITAN chipset, offers high definition voice quality through TI voice engine, HD handset, HD speaker and HD codec (G.722). With a large, high-resolution graphical display and 48 keys, this particular addition to the SIP-T2 series offers an excellent user experience to configure, make calls, express XML browser, etc. Moreover, to avoid problems with unwanted violations of your audio data, the Yealink T28P supports the security standards TLS, SRTP, HTTPS, 802.1x, Open VPN and AES encryption which are necessary to protect against electronic eavesdropping and data theft.